if anyone can help that would be great, if anyone knows any info on the old girl, as it is an unknown factor to us. 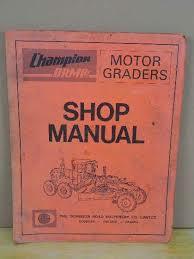 l just bought a download for the Champion 500 & 600 series operator manual, but have not got the download link as yet. But by the look of it, it may be a different model, l bought the one below, but it also says it is the 500 & 600 Series...???? The Grader was made 1975? just before Champion bought DRM ( dominion road machinery company ) in 1977 l think. this being a Horse draw machine built of all steel construction. The Copp brothers were bought out in 1897 and the company changed to the "Good Roads Machinery Company". The original American company taking control in 1909, with the firm being known as the "American Road Machinery Company of Canada Ltd". In the American depression of the 1920 the companies parted, and became "The Dominion Road Machinery Company". A powered model based on the McCormick-Deering tractor was launched in 1928, called the "powered Maintainer". A Hydraulic operated version the "Hydraulic Powered Maintainer was Launched in 1936. With dual tandem drive (6x4) from 1939. Then introduced blade lift for bank triming in 1946. In the 1950s they dropped other lines and concentrated on Grader production. The D500 series introduced. Fitted with a 12 ft blade and Choice of engines from 85-140 hp from GM or IHC. The 1960 saw the D600 series introduced, with 160-190 hp engines. Then in 1975 a redesigned D700 series was introduced, the first with articulated bodies. this was a massive machine with a 24 ft blade, weighing in at about 90 ton with a 700hp Cummins engine. Few were built and in 1989 the design was sold off to the Dom-ex Corporation in Minnesota. Company name changed to Champion Road Machinery Company in 1977 from the Dominion name. renamed as "G" designations and Champion was dropped for the Volvo name on the machines. Production continued in Canada, but the Articulated versions were discontinued. Volvo introduced a new G900 series in 2006, with seven model line up, from 155-265 hp. Powered Maintainer, of 1928 was first tractor based model. Hydraulic Powered Maintainer, of 1936 was first hydraulic controlled model. 507 Utility Grader, 47 hp based on a converted tractor skid unit. Series VI upgrade in 1999 then Volvo dropped the Champion Name. Hi and welcome thanks for the information please let us know how you get on with your latest acquisitions. When I hear Champion I think of a horse. Yes l have just about what l need and l sent them all to Holger to list on this site for you all.